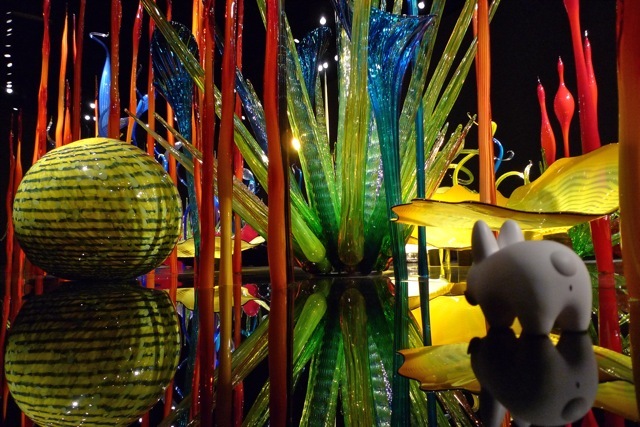 The last item on Pipkin and Domo's Seattle itinerary is Chihuly Garden and Glass, the largest museum showcasing the work of American glassblower (and Seattleite) Dale Chihuly. The museum is new to Seattle, having opened in May 2012 at the Seattle Center, and it exhibits Chihuly's work both indoors and out. Keep this in mind, as it is a treat to visit this museum at sunset so you can see details in the work in daylight, but catch the dazzling reflections as the glass is lit at night. Inside the museum it is quite dark, so if you're losing daylight, head outside first, and then continue with the exhibits inside. Pip and Domo headed to the museum straight from the Seattle Aquarium. There was still plenty of daylight left, so they began inside. The following pictures are only a small selection of the pictures Domo and Pipkin took. 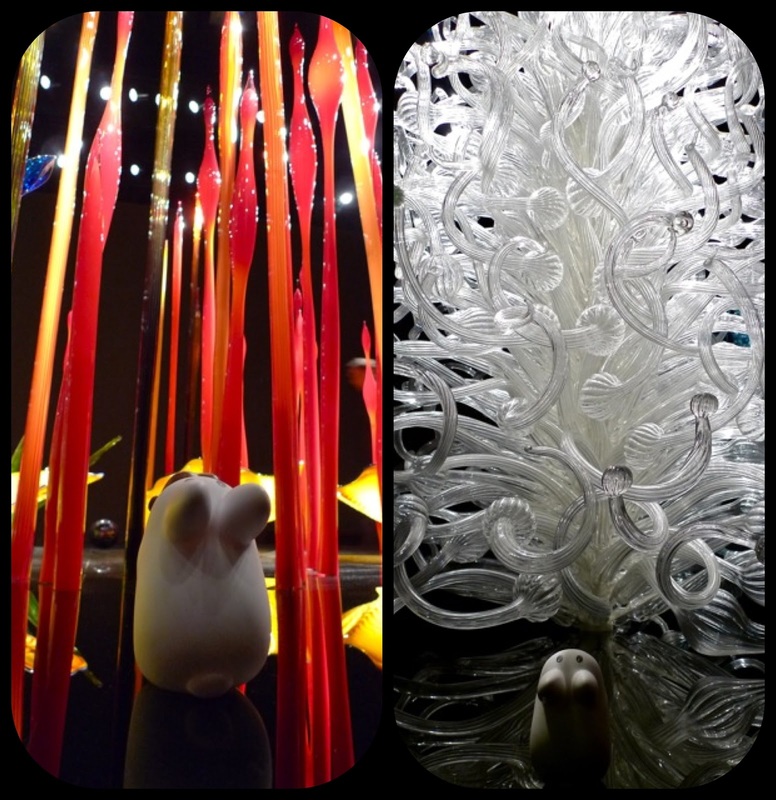 Chihuly is breathtaking, but if they showed you everything, you wouldn't have many surprises left. So, here are a dozen photos of some of the things they saw. 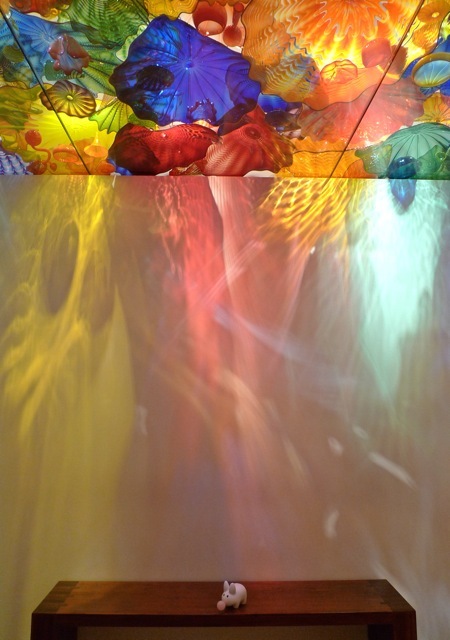 These first two are from The Persian Ceiling, a large installation of colorful blown glass shapes that are lit and displayed from above, casting a rainbow of shadows on its viewers. 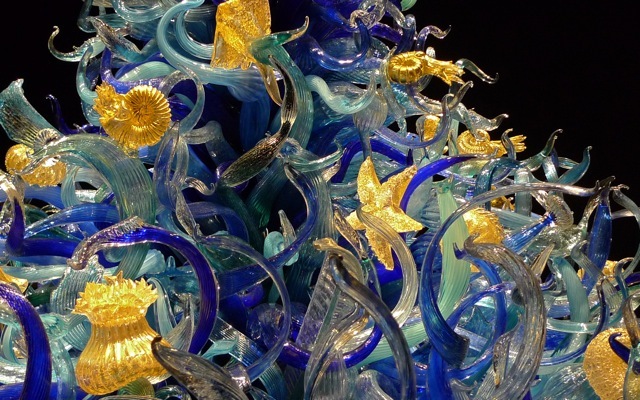 Chihuly's Sealife is a giant tower of aqua colored waves, hiding various sea life such as starfish, anemone, and shellfish. 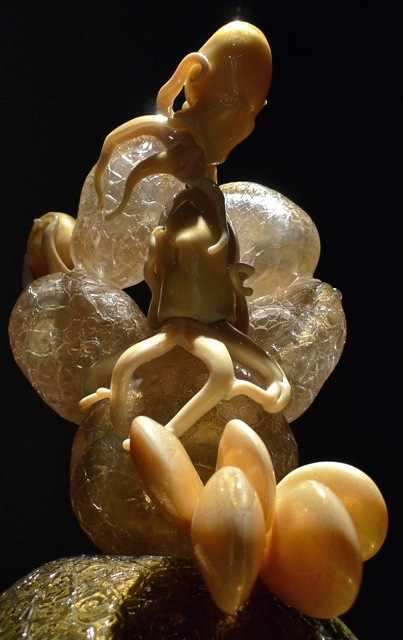 Before you start thinking Chihuly's vision is limited to bright colors and free forms, here is an example of one of his sea life glass sculptures in a more subdued palette. 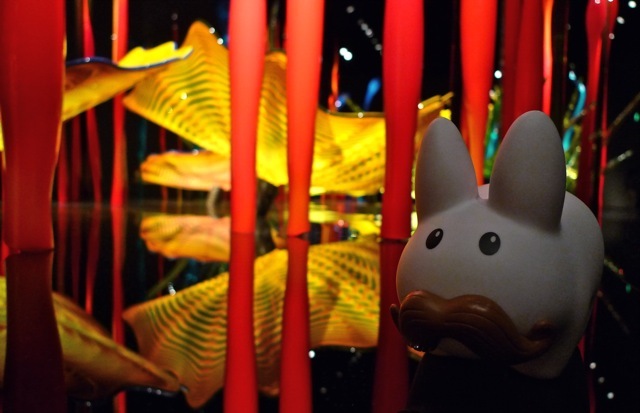 Many of the indoor installations were exhibited on a black glassy surface that made the colors stand out. 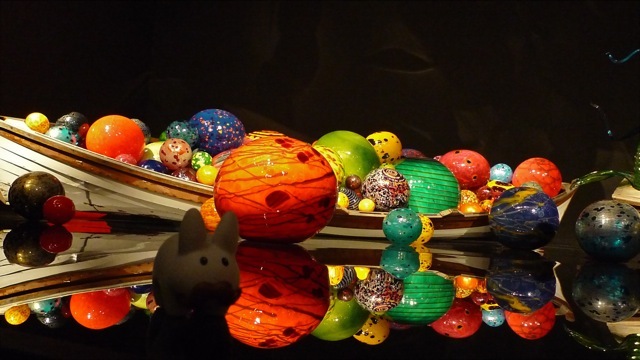 In this installation, Pipkin imagines these boats gliding silently through space, spreading planets across the universe. Pipkin wanted to wander through the Flori but he worried he might get lost. If Alice's Wonderland was made of glass, this is what it might look like. This was Pipkin's favorite room. 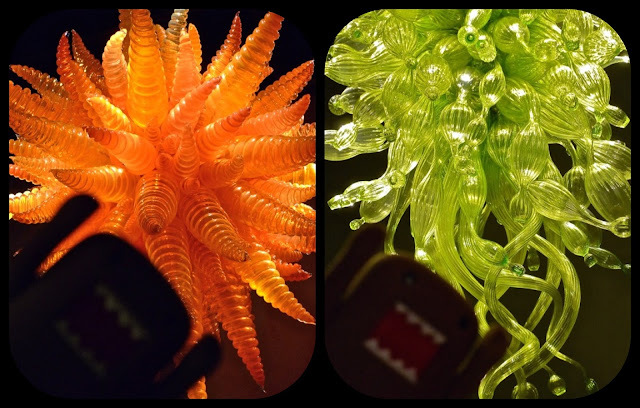 Pipkin and Domo had never seen such large pieces of blown glass, much less so many pieces of large blown glass in a collection, and so many collections in a single museum...and they've only explored indoors! Some of the glass towers and chandeliers would make you feel very, very small. There are several other treasures to be seen inside the Chihuly Garden and Glass, but you should discover them on your own, in person. Stay tuned for the next post, where Pipkin and Domo make their way outside to see the Garden at sunset. Wow. I wish I'd known about the Chihuly museum when I was there in June, but I'm not sure we would've had time to go anyways. 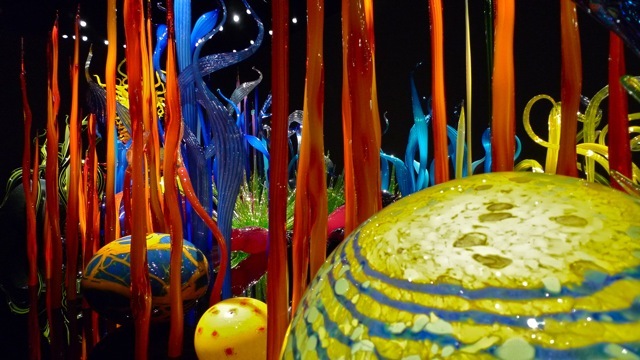 Dale Chihuly has some serious glass-blowing talent. Dr. Duck wanted to take glass-blowing lessons, but then decided that being rubber and being near a very hot fire was a bad combination. Luckily the museum isn't a limited time experience, it's there to stay for the foreseeable future. I hope you and Dr. Duck make it out there to visit! It's nice to see so much of his work in one place. 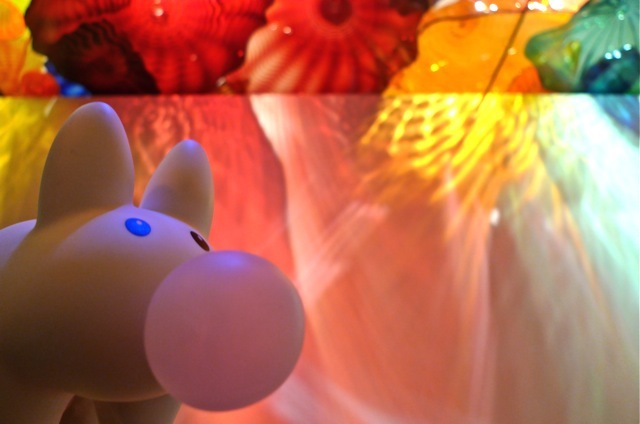 Pipkin also melts in the heat (he's soft vinyl himself) and labbits do not like being in an oven (eep). 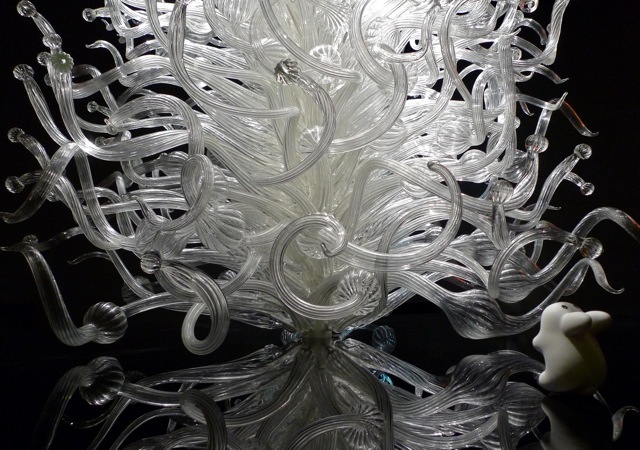 Dale Chihuly certainly is talented, as are the many glassblowers that now physically handle the glassblowing. He no longer blows glass because of an arm injury he suffered in the late 70s, but he did continue to blow glass after a car accident left him with vision in only one eye. 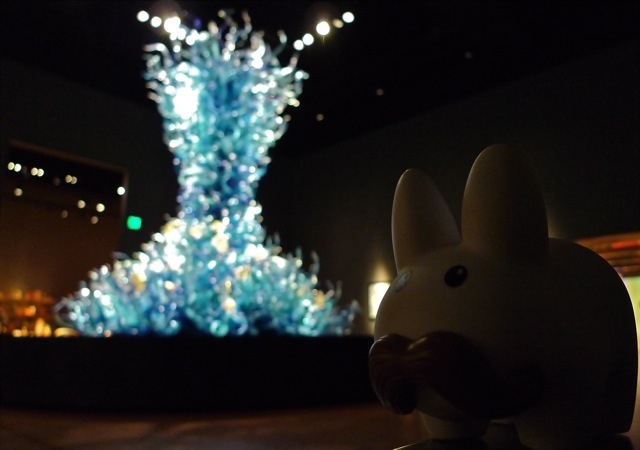 Pipkin thinks Chihuly looks so BA with an eyepatch. This is amazing! I really love it, very creative.